Most navigation systems approved for en route and terminal operations under IFR, such as VOR, NDB, and GPS, may also be approved to conduct IAPs. The most common systems in use in the United States are the ILS, simplified directional facility (SDF), localizer-type directional aid (LDA), and microwave landing system (MLS). These systems operate independently of other navigation systems. There are new systems being developed, such as WAAS and LAAS. Other systems have been developed for special use. A localizer providing horizontal (left/right) guidance along the extended centerline of the runway. A glideslope (GS) providing vertical (up/down) guidance toward the runway touchdown point, usually at a 3° slope. Marker beacons providing range information along the approach path. Approach lights assisting in the transition from instrument to visual flight. Compass locators providing transition from en route NAVAIDs to the ILS system and assisting in holding procedures, tracking the localizer course, identifying the marker beacon sites, and providing a FAF for ADF approaches. DME collocated with the GS transmitter providing positive distance-to-touchdown information or DME associated with another nearby facility (VOR or standalone), if specified in the approach procedure. ILS approaches are categorized into three different types of approaches based on the equipment at the airport and the experience level of the pilot. Category I approaches provide for approach height above touchdown of not less than 200 feet. Category II approaches provide for approach to a height above touchdown of not less than 100 feet. Category III approaches provide lower minimums for approaches without a decision height minimum. While pilots need only be instrument rated and the aircraft be equipped with the appropriate airborne equipment to execute Category I approaches, Category II and III approaches require special certification for the pilots, ground equipment, and airborne equipment. The ILS uses a number of different ground facilities. These facilities may be used as a part of the ILS system, as well as part of another approach. For example, the compass locator may be used with NDB approaches. 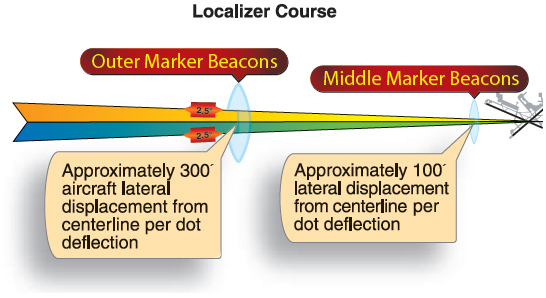 The localizer course width is defined as the angular displacement at any point along the course between a full “fly-left” (CDI needle fully deflected to the left) and a full “fly-right” indication (CDI needle fully deflected to the right). Each localizer facility is audibly identified by a three-letter designator transmitted at frequent regular intervals. The ILS identification is preceded by the letter “I” (two dots). For example, the ILS localizer at Springfield, Missouri, transmits the identifier ISGF. The localizer includes a voice feature on its frequency for use by the associated ATC facility in issuing approach and landing instructions. The localizer course is very narrow, normally 5°. This results in high needle sensitivity. With this course width, a full-scale deflection shows when the aircraft is 2.5° to either side of the centerline. 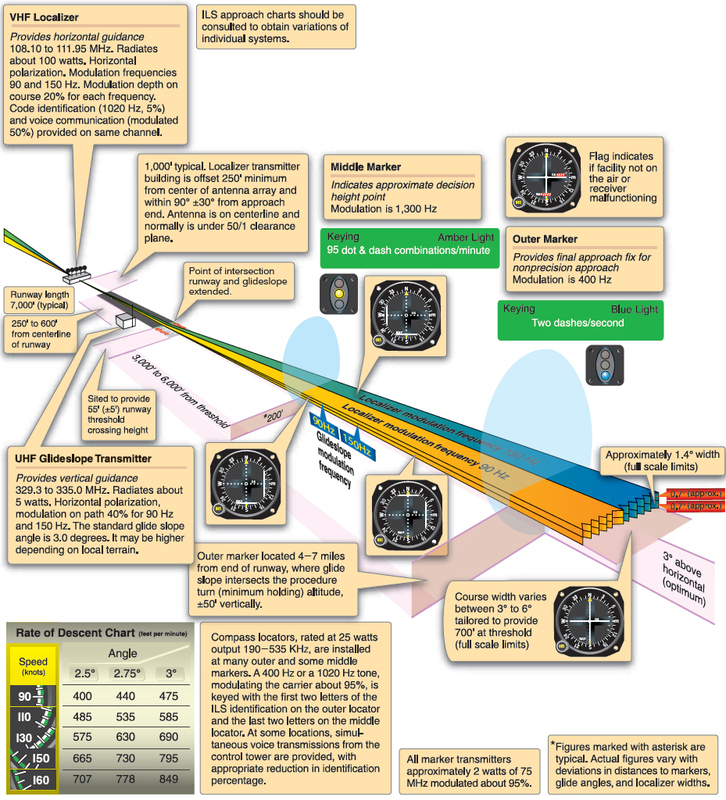 This sensitivity permits accurate orientation to the landing runway. With no more than onequarter scale deflection maintained, the aircraft will be aligned with the runway. GS describes the systems that generate, receive, and indicate the ground facility radiation pattern. The glidepath is the straight, sloped line the aircraft should fly in its descent from where the GS intersects the altitude used for approaching the FAF to the runway touchdown zone. The GS equipment is housed in a building approximately 750 to 1,250 feet down the runway from the approach end of the runway and between 400 and 600 feet to one side of the centerline. 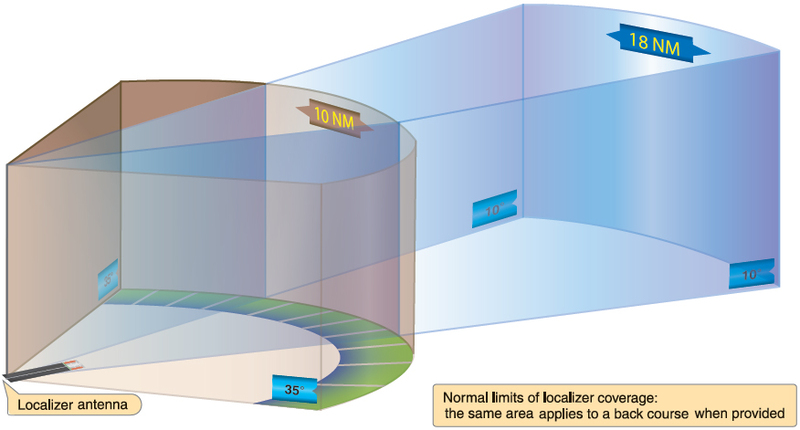 The course projected by the GS equipment is essentially the same as would be generated by a localizer operating on its side. The GS projection angle is normally adjusted to 2.5° to 3.5° above horizontal, so it intersects the MM at about 200 feet and the OM at about 1,400 feet above the runway elevation. At locations where standard minimum obstruction clearance cannot be obtained with the normal maximum GS angle, the GS equipment is displaced farther from the approach end of the runway if the length of the runway permits; or the GS angle may be increased up to 4°. Unlike the localizer, the GS transmitter radiates signals only in the direction of the final approach on the front course. The system provides no vertical guidance for approaches on the back course. The glidepath is normally 1.4° thick. At 10 NM from the point of touchdown, this represents a vertical distance of approximately 1,500 feet, narrowing to a few feet at touchdown. Two VHF marker beacons, outer and middle, are normally used in the ILS system. [Figure 9-35] A third beacon, the inner, is used where Category II operations are certified. A marker beacon may also be installed to indicate the FAF on the ILS back course. Figure 9-35. Localizer receiver indications and aircraft displacement. The OM is located on the localizer front course 4–7 miles from the airport to indicate a position at which an aircraft, at the appropriate altitude on the localizer course, will intercept the glidepath. The MM is located approximately 3,500 feet from the landing threshold on the centerline of the localizer front course at a position where the GS centerline is about 200 feet above the touchdown zone elevation. The inner marker (IM), where installed, is located on the front course between the MM and the landing threshold. It indicates the point at which an aircraft is at the decision height on the glidepath during a Category II ILS approach. The back-course marker, where installed, indicates the back-course FAF.